Bottom line: The Mountain Goats are my all-around, go to sandals. If I could have ONE pair of shoes to do everything in the world, these would be them. Wallpaper Wednesday in the neighborhood, yo! Interested in the specifics that go beyond THE Guide to Minimalist Sandals? Well, here's what we think about the Unshoes Wokova. They aren't my #1 rated sandal, but with a few modifications (including epoxying the screws in place) they are a really great value. The thinnest option for this sandal would make for a great road running shoe! Furthermore, if you have interestingly shaped feet, they provide more options for getting the right fit without going fully custom. A branch of from THE Guide to Minimalist Sandals, we have the long-awaited review of the Luna Oso. The Straight Dope: I love this sandal. I wear it on long trail runs and rocky climbing approaches alike. -The MGT (Monkey Grip Technology) footbed somehow manages to be super sticky, yet also not make your foot sweat too much. I suspect that magic of some sort to be involved. The fact that some of it also lies on the inside of the webbing straps makes this the rugged Cadillac of sandals. -While I was skeptical at first, the tech strap does indeed add some stability to the sandal, keeping it glued to your foot even in steep terrain. Extra resources: Listen in to our interview with Barefoot Ted here! “I thought of that while riding my bicycle!” Albert Einstein is said to have proclaimed of the Theory of Relativity. Michael Gelb found a similar trend in his book How to Think Like Leonardo da Vinci. Most people came up with their best ideas in the shower, resting in bed, or walking in nature rather than when working. The concepts of the ‘left’ and ‘right’ brains (I say concepts because these are generalizations - there are many more nuances to the way the brains actually work) have fundamentally contrasting methodologies by which they process information. It's like taking an artist and a scientist and contrasting them - the scientist will believe only that which is proven by repeated and repeatable experimentation, and the artist is able to create based on little more than meandering thoughts. The scientist sees the world as conforming to a set of infrangible rules, whereas the artist believes, with a sprinkle of creativity on top of it, possibilities are infinite and rules don't exist - only customs to be broken. Betty Edwards explains in her books Drawing on the Right Side of the Brain and Drawing on the Artist Within that the creative process requires the unique skills of both the left and right brain. You see, the process occurs in five steps: first insight, saturation, incubation, illumination, and verification. Saturation (where information for the project is gathered) and verification (translating the creative work into a common language) are both left-brain skills... the rest are very characteristically right brain. Have you ever been working on something creative - writing, designing a poster, or attempting to eat a quart of ice cream in one bite - and just gotten stuck, only to disengage with a trail run and the solution pops into your mind without warning? That’s the right brain’s role in the creative process. Remember, as important as full engagement is, complete disengagement is just as important. Those revolutionary, original creative insights don’t come as often when scrolling Facebook. 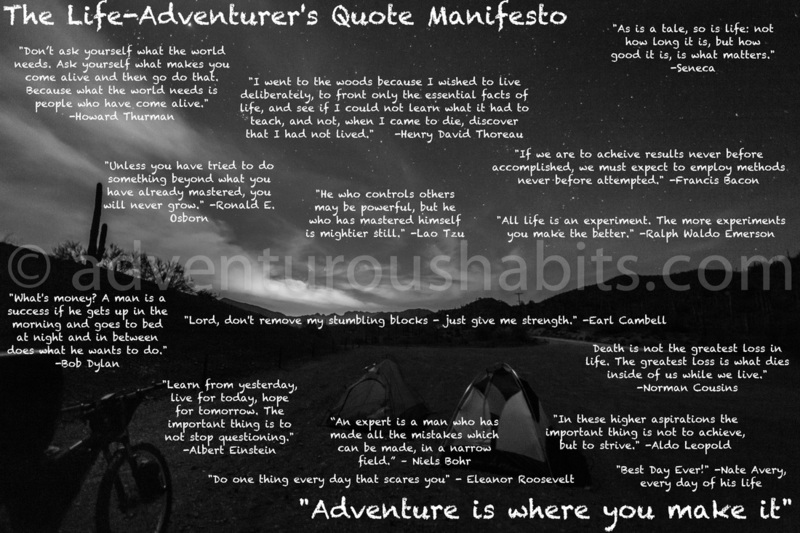 Instead, cultivate them by going on adventures - climbing, running (with meditation in motion), or mountain biking. Since right-brain based aptitudes will define successful companies and people in the Conceptual Age according to Dan Pink’s A Whole New Mind, cultivating your creative side with disengagement may provide benefits to your work life as well as reduce stress and increase contentment. So what's your creative cultivation going to consist of? So last week we ended with a question: how do habits work? There are three steps, Charles Duhigg explains in his book The Power of Habit. The cue (the reminder to begin the habit), the Routine (the habit itself), and the Reward. Perhaps you brush your teeth every morning and evening. The cue for you is waking up and going to bed - two things you do every day. The habit is actually going to brush your teeth, and the reward is that your mouth feels so fresh and clean afterwards. Perhaps you were not good at brushing your teeth as a child - the reward of having a clean mouth wasn’t good enough. Now, though, you have a significant other that won’t kiss you until your mouth is clean. The reminder? Wanting to kiss your significant other. The routine is of course brushing your teeth, and the reward is a kiss. Wow! Let’s glean an important note from that example - some rewards are not motivating enough to embed the habit. If you find yourself not completing a habit, make sure to change your reward to something that is more motivating! For example, I got off track on my meditation habit for a looonggg time, insisting that it was because of travel or other concerns (excuses). Finally, I decided that the reward would be my morning tea (or coffee). I placed my Emwave2 on the counter in front of my kettle as a cue, and had to meditate before making my beloved tea. That reward was highly motivating for me, and I finally engrained the meditation habit, which is certainly my keystone habit (discussed below). So we are not wired for long-term rewards... then why would anyone make a goal of losing 40 pounds, running a marathon, adding 25 pounds to your bench press, starting a business, stopping smoking, traditional lead climbing 5.11, or getting promoted? Those rewards are too far in the future! Sure, some people are able to succeed with those goals, but what you will find is that they are able to create habits that allow them to achieve those goals. Life-changing accomplishments are great, but identity-redefining habits are how you ensure you get there. There is something else you should know about habits: they are addictive. They are more addictive than drugs. Duhigg notes that years after former smokers have given up smoking, they may still crave a cigarette. How!? The chemical involved in the addiction has not been through their body in years! It is not actually the chemical they crave, but the habit. This means it is almost impossible to just ‘give up’ a habit. What is possible, instead, is creating new habits (easier) or replacing bad habits with good habits (more challenging). I used to eat breakfast - it’s the most important meal of the day, right!? When I decided to change my life around after football, I tried to make big change after big change, and all of them were successful for a couple weeks before I went crashing back to my old habits. Ultimately, I made small changes to my habits, one at a time - starting with breakfast. Originally, I used breakfast - which I already did every single day - as my cue. Every morning when I got up, I wanted breakfast. That reminded me that I was not going to have breakfast - instead I would have coffee. When first starting out, I used ‘Bulletproof Coffee’ as part of the ‘Bulletproof Fasting’ protocol. By replacing the breakfast habit with coffee, I was able to remind myself every morning using a habit that I already had, yet still get the reward my body was craving by drinking coffee instead. This kicked off my intermittent fasting habit. Ultimately, I used the same process to convert my coffee habit into a yerba mate habit. I then used my yerba mate habit to kick off a writing habit - every time I enjoyed my morning mate, I wrote pages in this book. No matter how many pages or half-pages I completed, I danced by myself in celebration after writing. Clothes were usually not involved. #1. Focus on one small shift at a time. It is easy to set lofty goals, but effective to make small changes. This is easy for fun stuff like drinking tea. For some, it may be harder for taking a cold shower or working out. You must find the good in it and create this mindset shift. How awesome is it that you have cold water available to you, which makes you feel like a superhero afterwards? 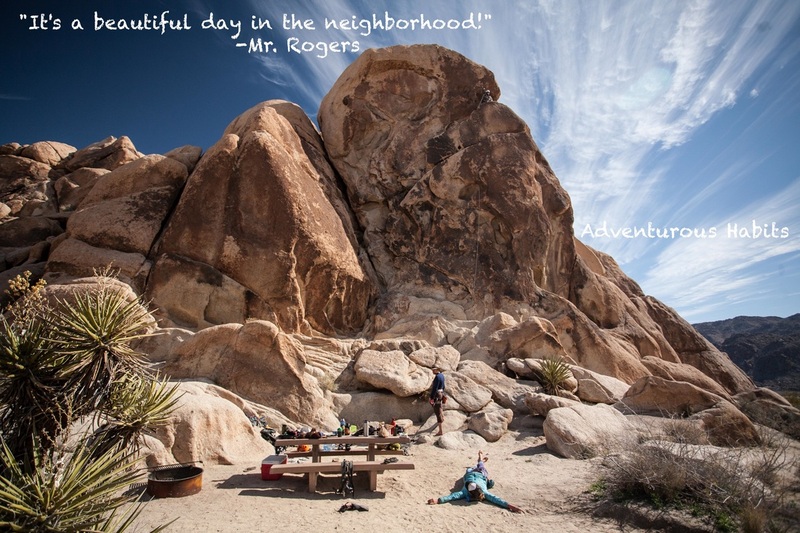 How amazing is it that you get to take a break from work and play with the most fundamental of human pleasures, moving and interacting physically with the world? #3. Create a cue based around a current habit or just things that happen everyday. What do you do every single day? Wake up, brush your teeth, eat a dinosaur, leave a room, put your clothes on (hopefully), look at yourself in the mirror, talk to a friend, hear music, say the word ‘bro’? Try to create a list of these things - any of them can serve as a cue for a new habit that you are going to form. If you are looking to do a habit replacement, then obviously the former habit is going to be the cue. Please don’t try to make a new habit of writing and require that you write at least 6 pages every morning. It just won’t work. Instead, make your habit so easy to start that you just can’t say no to doing it. Write one sentence every morning after tea. Meditate for ninety seconds after waking up. Do five body squats after every hour of working. Often, you will feel inspired to just go ahead and do more once you get started, and on the days that you aren’t inspired, you still stuck to your habit. Good job! This is the reward part of the cycle. Always reward yourself, no matter how small the success. With morning tea, the tea itself is enough of a reward. With writing or working out, do something that makes you happy, whether it is telling yourself “you are one baaaaaad Brave Monkey,” eating chocolate, dancing, or playing with puppies and sparkles. Remember, if you find yourself not completing the habit, the reward might not be motivating enough - try to change it so it is motivating. Just as the keystone in an arch supports the weight of the rest of the arch and will cause the entire structure to collapse if removed, keystone habits serve to keep the rest of your habits, and life, in balance. For many people, exercise is a keystone habit that influences other aspects of their life. When they exercise, they may also get to sleep earlier, resist poor food choices more easily, be more productive, and reduce stress more quickly. Did you know that people who exercise more, use their credit card less? For me, meditation and intermittent fasting are keystone habits - it seems that even when I am traveling and away from my usual routines, if I at least meditate and wait until mid-day to eat my first meal, I stay grounded, feeling well, and productive throughout the rest of my day, even if I don’t complete all of my usual habits. So what’s your keystone habit? 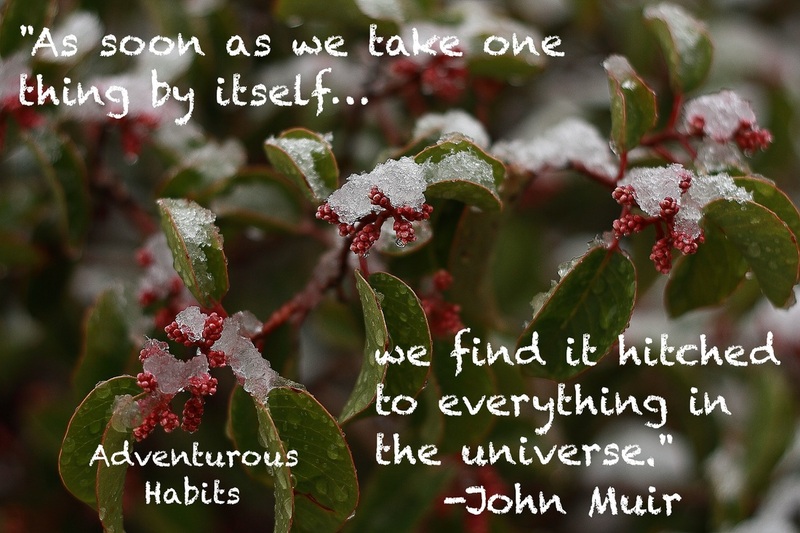 So how can a habit be adventurous? 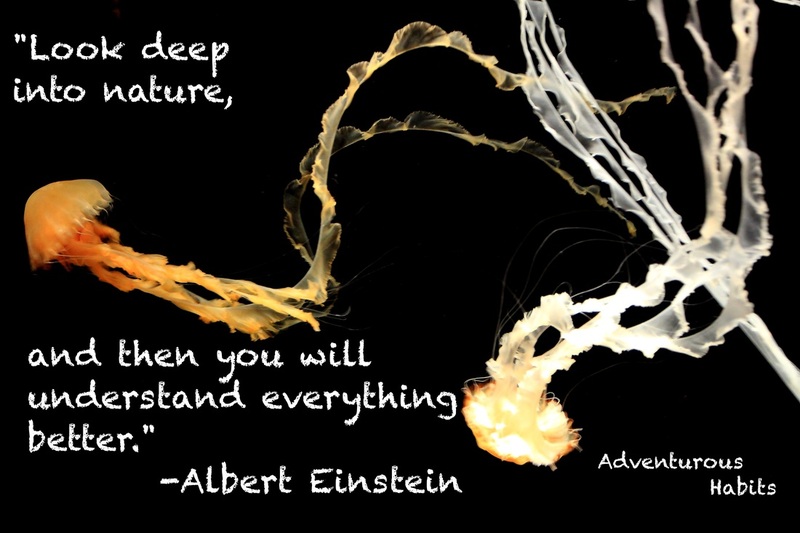 If something is adventurous, then by nature isn’t it NOT habitual? Well, there are two ways habits can be adventurous. The first is that the purpose here is to create the habit of getting out of your comfort zone, and making that comfortable. We grow most by doing the things that truly scare us and simultaneously make us come alive. If you can get in the habit of doing things that make you a bit uncomfortable and learning to make them comfortable, you are well on your way to taking over the world. Unfortunately, you don’t just do something once and become comfortable with it. I have traditionally climbed many, many routes. Every time, I still have to remind myself to focus on the process goal (we’ll discuss this later) of breathing deeply and smoothly throughout the route - I still have more practice to do before I am truly comfortable with this uncomfortable process. But I am making progress. So in making a habit of practicing this process in a specific way, I have made an adventurous habit. What uncomfortable task are you working on making comfortable? 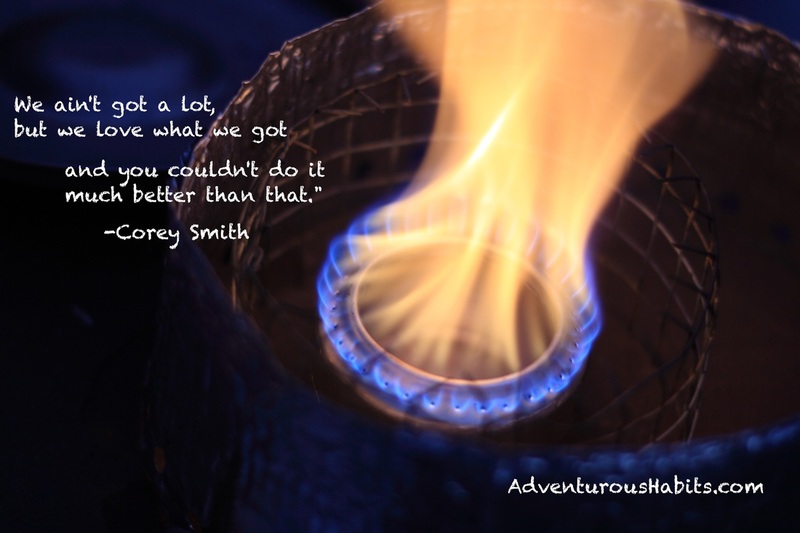 The second way a habit can be adventurous is in saving willpower to go and do the adventurous things you desire. There have been plenty of times that I wanted to go on a new trail run, but I was just so burned out at the end of my work day that I didn’t have the willpower to go and venture into the unknown. By creating daily habits that serve to renew my energy and focus, I can save willpower for later in the day when I want to practice making myself uncomfortable. How much willpower do you have? Rank yourself on a scale of 0 - 10. If you favorite unhealthy food is on the counter in front of you, how many times out of 10 will you eat it? Compare 10 times in the early morning vs. after work. We have a problem with an important societal convention. We tend to think of willpower as something you either have or you don’t, and if you have it... well, you just need to use it! The problem is that willpower is much like a muscle - it can be trained and get stronger, but it can also get tired and ineffective if you use it too much! If you spend all day at a job you hate, willing yourself onward to get through the next meeting, your willpower will be tired when you get home. Now just try to will yourself to go on that run or to decline that cookie - ha! Luckily for us, science is beginning to show us the extreme power of habit. We’ll get into the specifics of habits next week, but first know this: completing a habit is essentially allowing your brain to go on autopilot. Read into this: no willpower required! By using the science of habit formation, you can free up more willpower that can be used when you really need it. Hold up - read that last sentence again. Habits free up more willpower. Yeah, habits are powerful; this the Brave Monkeys know. However, we have to know how to effectively create habits, first. Tune in next Thursday for The Straight Dope on Habit Formation.